International Space Station residents Scott Kelly and Kjell Lindgren are gearing up for a pair of spacewalks set for this Wednesday and Friday, November 6. As part of their two excursions, Kelly and Lindgren will be continuing to prepare the exterior of the Station for Commercial Crew Vehicles and dual-berthed cargo missions. 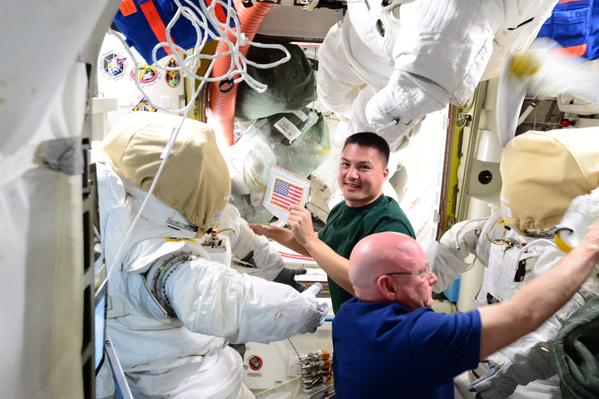 They will also complete different maintenance and outfitting tasks to keep ISS in ship shape. It will be the first EVA for both Kelly and Lindgren, coming in the midst of Kelly’s one-year tour aboard the orbiting outpost. The EVAs are occurring in somewhat of a downtime in terms of visiting vehicle traffic before the pace of operations will pick up towards the end of the year and the beginning of 2016 as Orbital ATK’s Cygnus and SpaceX’s Dragon return to flight. 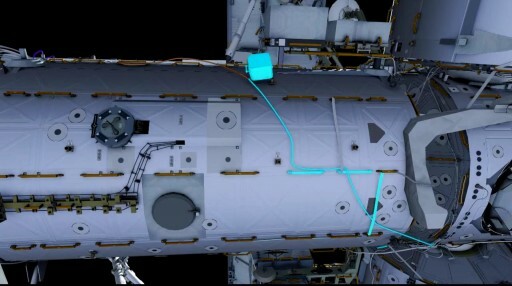 The outline of Kelly and Lindgren’s EVAs had to be changed on short notice in response to the failure of the Dragon SpX-7 mission that was to carry to ISS the first of two International Docking Adapters which was intended to be installed during one of the EVAs on the forward port of Pressurized Mating Adapter 2. 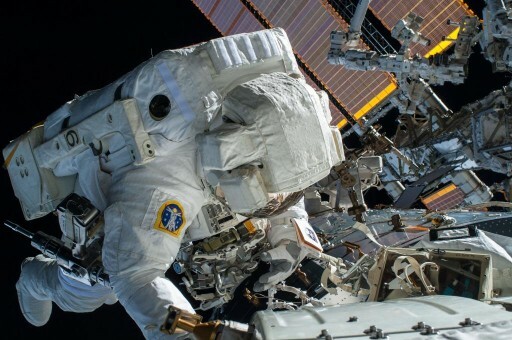 Additionally, it was planned that PMA-3 would be relocated prior to the EVAs so that the two spacewalkers could begin its outfitting for the installation of the next docking adapter. With these two major tasks eliminated, the EVAs were realigned to tackle a backlog of tasks that have built-up of over the past years. Kelly and Lindgren spent the last several weeks preparing for the spacewalks – spending plenty of time in the Quest Airlock where they readied the two Extravehicular Mobility Units to be used on the EVAs (#3003 & #3010) – requiring a number of equipment replacements and the usual resizing to provide a good fit to each crew member. They also completed extensive reviews of procedures and checklists as many of their tasks were added to the EVAs when they were already in space. 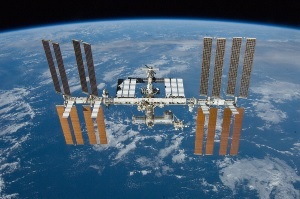 ISS as a program made a significant transition in EVA training where much of the procedure reviews and training operations are done in space with ground training only involving the completion of generic tasks as compared to Space Shuttle EVAs that were usually rehearsed multiple times on the ground. Wednesday’s EVA is filled with a mix of tasks ranging from putting a thermal cover over the Alpha Magnetic Spectrometer 2, removing a cover from a Main Bus Switching Unit, lubricating the Station’s robotic arm and routing more cables in preparation for the installation of the International Docking Adapters as well as re-installing a Non-Propulsive Vent on the Node 3 module. Designated EV-1, Scott Kelly will be first out of the Quest Airlock with an EVA start time targeting 12:10 UTC on Wednesday. 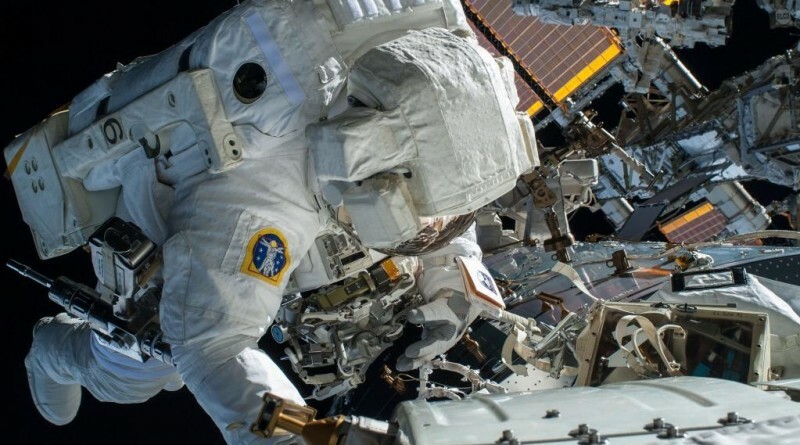 Lindgren will hand out bags and tools to Kelly before climbing out himself followed by the usual checks of the Space Suits, their cameras and SAFER safety systems before the two spacewalkers can head off. Kelly will be carrying the Multilayer Insulation bag while Lindgren will take the Lubrication Tools for the robotic arm to a temp-stow location. The crew will then begin their outboard translation to the Express Logistics Carrier 2 where they will temporarily stow their equipment bags and retrieve an Articulating Portable Foot Restraint. 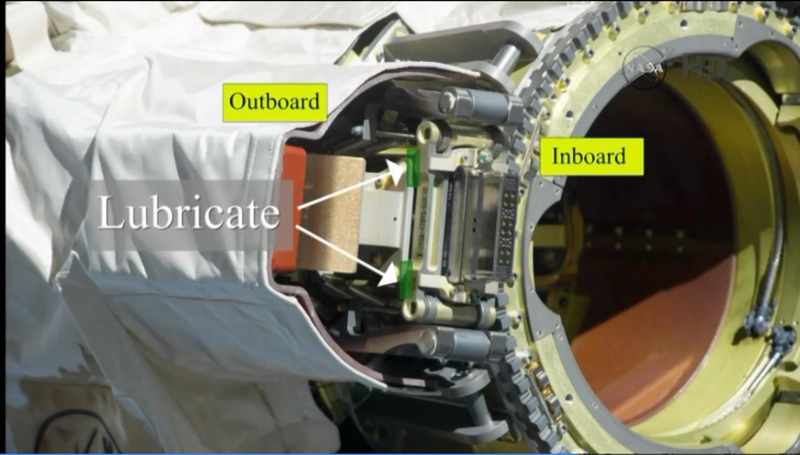 Scott Kelly will work on the spare MBSU (Main Bus Switching Unit) residing on ELC-2, removing its Multilayer Insulation Cover and tying down any tabs so that the unit could be retrieved robotically in the future. With the cover in place, the replacement of an MBSU needed a crew outside to retrieve the spare given the cover obstructed the grapple fixtures and holding pin of the unit, preventing the Station’s robots from accessing the system. With the cover out of the way, future MBSU replacements can be assisted by the robotic arm and Dextre robot. Lindgren will take the foot restraint to AMS-2, setting it up near the CETA cart for additional hand-holds and a stable anchor platform when working on the Station’s flagship payload that found its place on the truss of ISS in 2011, being delivered on the penultimate Space Shuttle mission. When ingressing the APFR, Lindgren will first put in place a wedge on one of the radiators of the AMS. Next is the installation of a large blanket that will use four straps to be tied down by Lindgren to provide added thermal protection to the AMS in the future, hoping to prolong the payload’s life by protecting the cooling pumps inside. 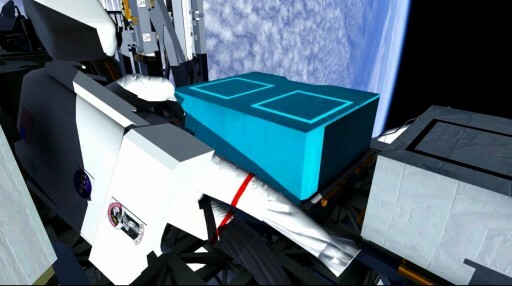 Especially during periods of high Beta-Angles, AMS showed unfavorable thermal trends and engineers needed to position the Station’s radiators to provide shade to the payload which will no longer be necessary with the cover in place. The two spacewalkers are going to head back to the airlock, bringing the removed MBSU blanket and foot restraint with them. At Quest, Lindgren will pick up a cable bag while Scott Kelly moves to External Stowage Platform 2 where he will set up the foot restraint for the Canadarm2 lubrication task for which both hands are needed. 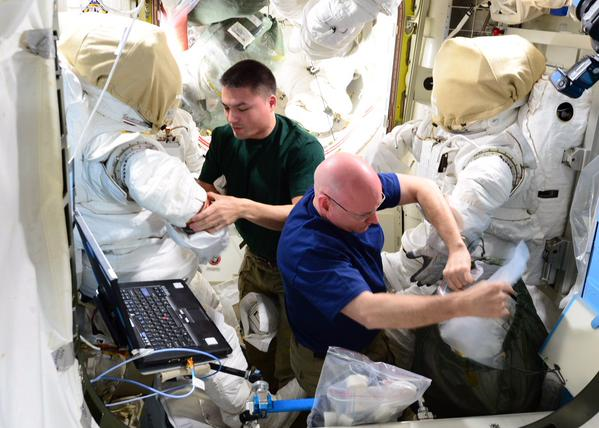 The LEE (Latching End Effector) lubrication on LEE-A was performed by Terry Virts on U.S. EVA-30 in February and Kelly will closely mirror what Virts did – just on the other end of the arm. This lubrication task was developed after the various motors and moving parts within the LEE were showing some signs of degradation such as high currents on the motors. To extend the operational life of Canadarm2, teams developed this lubrication technique, a task not expected ever to be performed in space. Because the arm was not built to have its LEE components serviced in orbit, Kelly is facing some work to be done blindly, only by feel. To provide him with some guidance for the lubrication of the Latch Ball Screws, he first will conduct a practice run on the larger Central Rigidizing Ball Screw that he can see and access easily in the center of the LEE. He will start without grease to get a feel of the behavior of the BLT, Ball Screw Lubrication Tool. 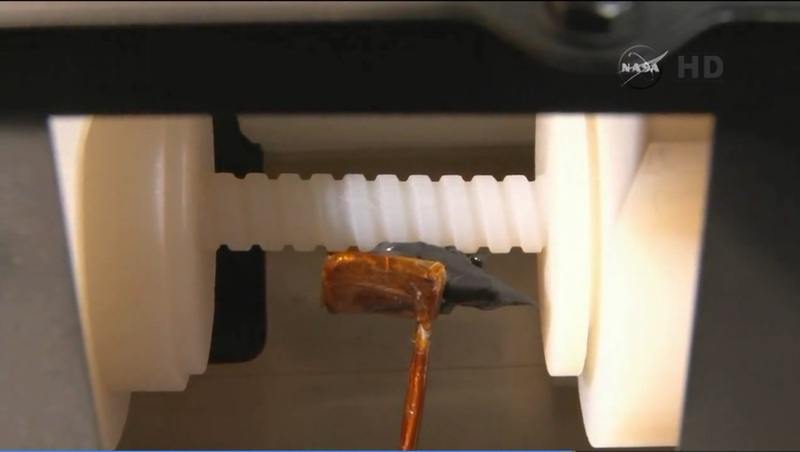 One run with grease is performed on the center screw for which Kelly uses a grease gun to transfer some gray vacuum grease onto a cradle at the tip of the BLT that is then inserted and moved around and along the screw to deposit grease onto it. Next will be the four Latch Ball Screws that Kelly can only access by feel and by using the depth finder on the BLT to transfer grease onto the screws. In between the individual lubrication tasks, the LEE of the arm will be rotated to ensure Kelly can have good access to each of the screws. When all four have been lubricated, the latches on the LEE will be retracted to reveal the Linear Bearing Tracks on which the latches glide when being retracted and deployed. Two tracks are part of each latch and lubrication is to be done on the inside and outside of each track amounting to a total of 16 locations to be lubricated. The tracks can be accessed directly with the grease gun, however some delicacy arises because Kelly has to pay close attention not to touch or lubricate the microswitches residing in between the bearing tracks. As part of the final tasks on the LEE, Kelly will manually move the brackets and rollers to assess whether they are still moving smoothly after being in operation for 13 years. Once all components are exercised once, he will begin the last round of lubrication – using the grease gun to directly put a dab of grease in front of the brackets and rollers to be distributed when the LEE is actuated. While Kelly completes the lengthy lubrication task, Lindgren will move over to the Destiny Lab where he will temp-stow the cable bag and begin pre-staging a series of cables between Node-2 Zenith and the Lab data port. 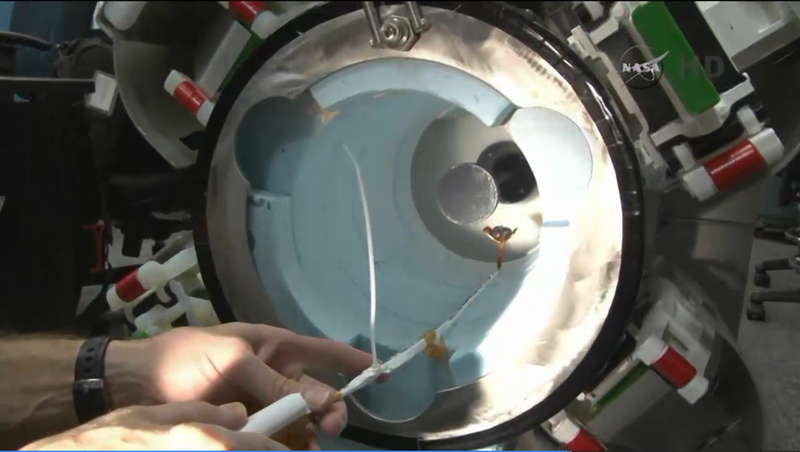 The first cable is colored orange and will carry data for PMA-3 and IDA-3 when installed in the future. Next is a power cable, color-coded in purple and white and Lindgren will again stow the forward half of the cable on the Lab and then route the second half to the aft to a port on the Node 1 module. Lindgren will break out of the cable task at that point to move over to Node 3 for the re-installation of a Non-Propulsive Vent. 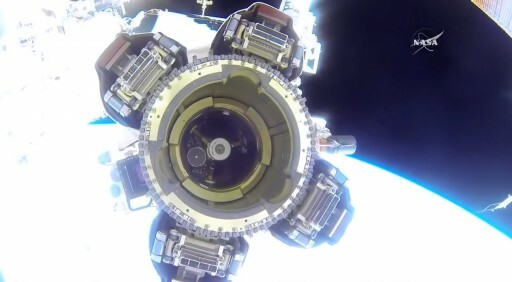 The NPV was removed on March 1 during EVA-31 because the relocation of the Permanent Multipurpose Module from Node 1 to Node 3 would have run into a clearance issue with the vent in place. At the vent location, Lindgren will use a Pistol Grip Tool to remove a cover plate that was used to protect the seals of the vent. After an inspection of the vent seals, Lindgren will use three bolts to put the NPV back in place – working in tight quarters in the gap between the Node and PMM. 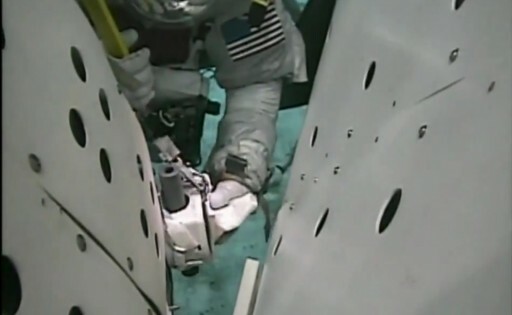 Kelly will stow the foot restraint when done with the arm and take care of routing the purple-white cable forward across the Lab and to Node 2 zenith to be ready for installation on PMA-3 and IDA-3. If time permits, Kelly will take care of a 1553 command and data cable, also to be routed between Node 1, along the Lab and to Node 2. Finally, both crew members will move back to the Quest airlock, make an inventory of tools and equipment, and check their suits before moving back inside with Lindgren leading the way followed by Scott Kelly. Getting out of their suits, the two crew members will set up for a nine-day turnaround to the second EVA, designated U.S. EVA-33 set for Friday, November 6. 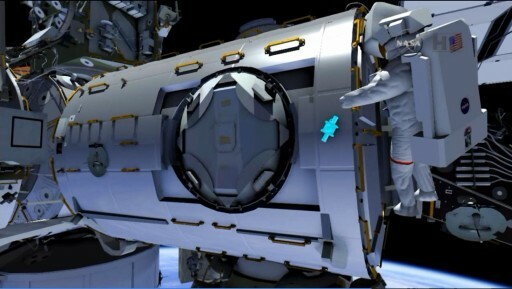 As part of that EVA, the two crew members will move all the way to the outermost port truss segment where they will spent several hours to return the P6 Photovoltaic Thermal Control System to a nominal configuration. The P6 PVTCS suffered a gradual ammonia leak in 2006 and teams went ahead and attempted to isolate different parts of the system to locate the leak. In 2012, spacewalkers Suni Williams and Aki Hoshide put in place jumpers and deployed the Trailing Thermal Control Radiator (TTCR), bypassing the P6 PVTCS radiator and routing the ammonia coolant through a system used in the early days of ISS. Unfortunately this did not stop the leak that accelerated significantly in 2012, requiring a contingency spacewalk to replace the Pump Flow Control Subassembly that was identified as the source of the leak. 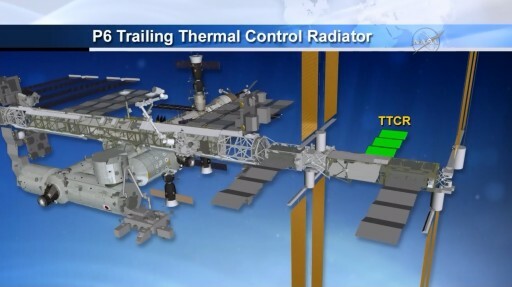 Kelly and Lindgren will be tasked with reversing the radiator configuration, again connecting the normal P6 radiator and stowing the TTCR, also performing an ammonia re-fill on the loop. These two U.S. EVAs will put the Station into a good configuration to head into 2016 when the first International Docking Adapter will arrive and the Pressurized Mating Adapter will be relocated, among a string of other operations outlined for the orbiting outpost.